Do you know what SEO is? >> Do you know what SEO is? Do you know what SEO is? If you do know what it is, then go you! You are ahead of the crowd (well, a lot of the crowd I talk to anyway). Many people I speak with have heard of SEO, but they don’t know what it stands for, let along what it is. I have gotten into the habit, when talking all things Google and digital marketing, of saying ‘SEO, that’s Search Engine Optimisation’. The simple explanation is that it’s where you come up in Google searches (or Bing or other search engines). Having great SEO results helps you be the big fish. I’ve been on a sharp learning curve recently, learning how to maximise SEO for myself and my clients without spending huge amounts of dollars. Here are five of the things I’ve implemented that have helped me move starfish marketing from page five of Google searches to page one, in one month*. If you haven’t set this up, go and do it now. This is a free Google service that helps you manage how your business information appears across Google. It includes Google Search and Google Maps. And did I mention IT’S FREE? It allows people to review your business and the more reviews you have, the better your SEO results. If you’re comfortable you can ask your favourite customers to complete a Google review for you. You can share information, your opening hours, your location etc etc – making it easy for people to find and contact you. And you get insights!!! How cool is that! You will see how your customers searched for your business and where they are coming from. Plus, much more. And then there’s long-tail keywords. What are long-tail keywords I hear you ask. Using long-tail keywords gives you an opportunity to be more precise with targeting your pages. If you’re not sure about what keywords to use – try googling them and seeing what comes up. Place your keywords throughout the content on your website. This comes with an additional tip - don’t sacrifice your branding or tone of your messaging and overpopulate with keywords. Make sure you’re still clear on your brand position and the key messages and brand essence you want to communicate. Keywords are something that you will need to look at throughout the life of your website. Times will change and the keywords that relate to your site and service will change too. So make sure that you pay attention to your keywords and you will be repaid with a well-ranked website. So, when you update your content on your webpage with your keywords, it isn’t just the content on the page that is important. The titles, meta tags and descriptions are too - in a different way though. Titles, meta tags and descriptions should be included in the back-end of your website. If you have a WordPress site, try installing Yoast– it’s an awesome plugin that will help you set up your titles, meta tags and descriptions to maximise your SEO – and it’s so easy to use! What are titles, meta tags and descriptions? Basically, they tell Google (and other search engines) and users about your site. They describe the content on each page of your website. And they can act as a “hook” for your advertising in the search engine results. You know when you Google something and the top (and bottom) three or four results have a little "Ad" box on the left side of the text - that’s SEM. SEM is like SEO except you pay for it. It is otherwise known as pay-per-click and will appear at the top or the bottom of your search page. SEO is free, and your SEO results will be in the middle of your search page. 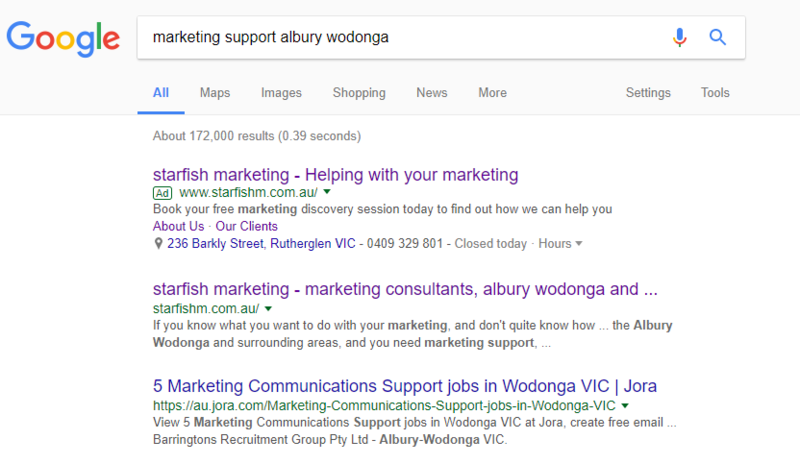 The example below shows starfish marketing SEM and SEO results for the search "marketing support albury wodonga". Apparently, SEM does have an impact on your SEO results (I asked this question at a Digital Marketing Bootcamp recently and was told it does). So yes, you can spend some money on SEM, however I don’t believe it has to be enormous amounts of money. I spend less than $10.00 per month. Now this means I'm not getting a lot of click throughs on my ad (because you only pay per click), but this is okay for me and the strategy I have behind my SEM. How much you spend as a business will depend on your strategy behind your SEM. Checking your results regularly and adjusting your SEM to meet your strategy objectives will influence the amount you spend. The way SEM works does not necessarily mean those who spend the most money end up at the top of the page. Google also looks at the content of your “ad” and that influences the placement too. So, the trick is to get your SEM ad with the right parameters set up, spend a little bit, look at your results and potentially tweak your ad (yes, you can change the content of your ad mid campaign). Oh, and SEM gives you access to things like Google Keyword Planner, which helps you find the keywords (refer point 1) that are most relevant to your business – no more guessing what you think your potential customers are searching for, Google will tell you. Apparently, Google likes it when there’s new stuff on your website (and your Google My Business page). So, sharing or updating your content regularly will help with your SEO. Having a blog is a great way to keep adding new stuff to your website. You don’t need to write war and peace – it could just be adding a simple tip each week or so. If blogging isn’t your thing and you prefer to play on social media, then consider including links from the social media platform back to your website. This also helps with SEO and can drive traffic to your site through social media. So, there you go, there’s five things that I’ve found have helped improve the SEO for my clients and myself – four of which are “free”. There are other things that can influence your SEO, but I think these are a good starting point. Go forth and land on page one. Bonus tip - set your business up on all the free directories such as Yellow Pages, White Pages, True Local, Local Search, Yelp etc. Disclaimer - moving to page one in one month is not a guaranteed result - it can take anywhere from one to six months (and sometimes longer) to see a difference in your SEO results, and can depend on various aspects of your business and online prescence. As with everything marketing, having the right strategy behind your approach is key, and there is no silver bullet! Hi, I'm Mell Millgate, great at marketing stuff. I'm living the starfish story and making a difference by helping businesses turn their marketing strategy into action. I'm also a wine lover, shoe fanatic, wishful traveller and cheese fiend. I am on a mission to make marketing easy and fun and make a difference - one starfish at a time! Do you understand your marketing mix?